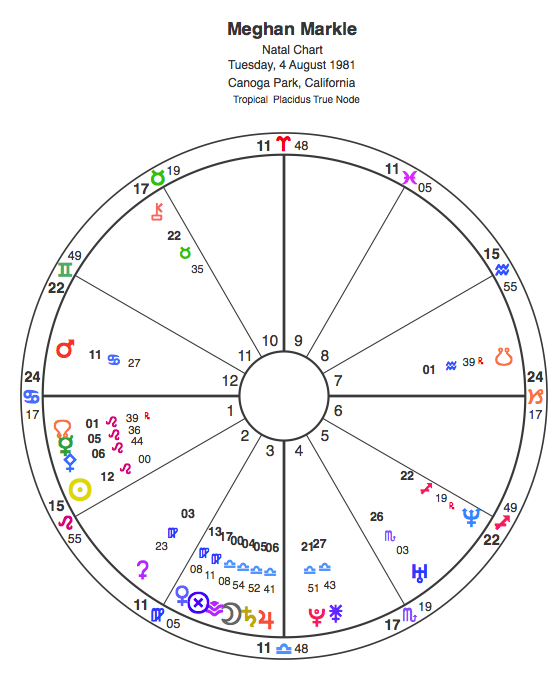 Astrology Chart for the Wedding of Prince Harry and Ms Meghan Markle. 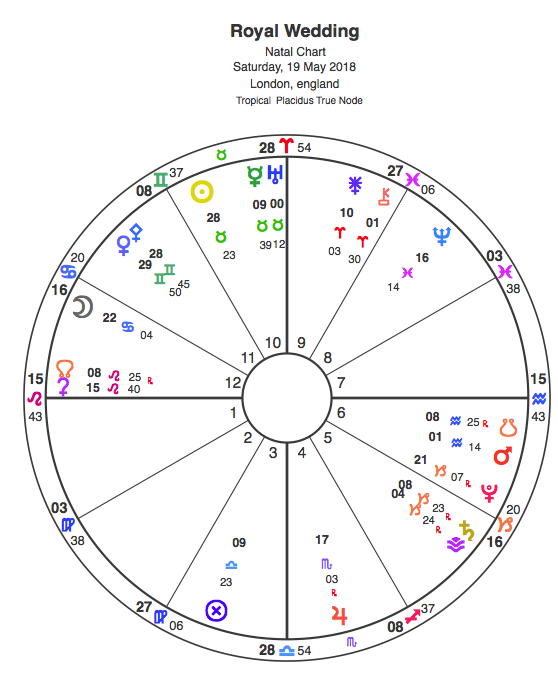 Very interesting to observe the Royal Family wedding in May just after Uranus heads into Taurus. Uranus is on the Midheaven conjunct Mercury. More than a few upsets there! And the Mercury influence means the whole world will hear about it. Who will refuse to attend the ceremony? Look at the planets and asteroids at 28/29 and 0 degrees! 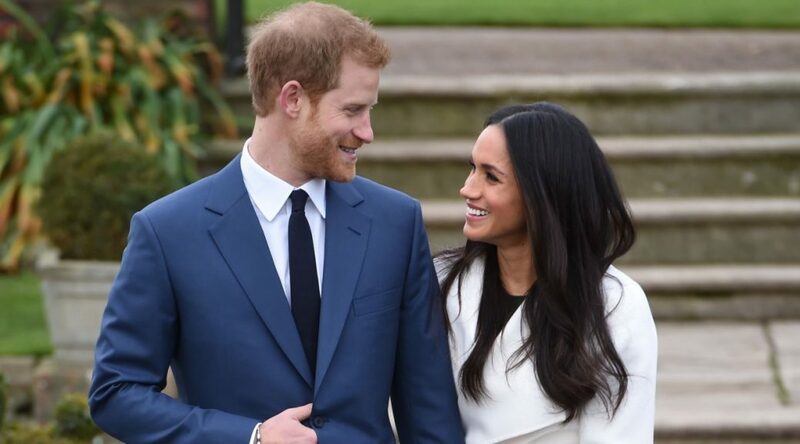 The Sun is the chart rule (and Meghan Markle’s Sun) about to exit Taurus as Uranus has entered. The fêted actress has leaving and a powerful communicator is moving in. This isn’t quiet “do good” but a speaker with strong convictions and unwavering principles irrespective of current mores. Prince Harry’s Rulers (Mercury for Sun and Saturn for Ascendent) are in a close trine. This is a long term relationship. This is what he wants. The part of fortune at the time of wedding (I know, I know it moves quickly) is exactly conjunct his part of fortune. He feels extremely lucky. Expect tears! Prince Harry has a Taurean moon. And Pluto in Taurus! At zero degrees! Uranus opposite natal Pluto is a “generation effect” but when you are a high profile person you lead that generation effect. Whatever happens at this wedding will impact marriage and how marriage is viewed – ricochets through the decades. Perhaps it’s religion or ethnicity. Gawd I hope it’s not fashion and hats! I doubt it – Harry’s Pluto is in the 9th house of global impact. Natal Venus in Libra will require kindness and fair negotiation above all else in a female companion and the Taurean north node will be a voyage of discovery away from politics & intrigue towards culture and making people comfortable. 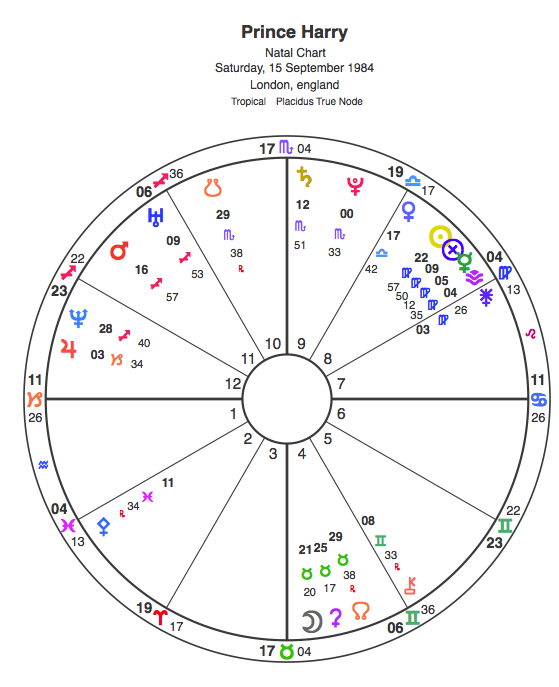 Prince Harry’s Taurean moon is being trined by transiting Pluto. This is not a small thing for him and evokes deep soul change. That Capricorn ascendent – viewing the world through the eyes of a practical structure. There is no rejection of rituals or rites of passage here. Quite conservative (Saturn ascendent and north node in Taurus) when taken away from temptations to behave addictively (south node in Scorpio)! Ms Meghan’s Cancerian ascendant means she is ruled by the Goddess of the Moon, the eternal feminine. Cancer feels deeply but defends family and women and ethnicity rights strongly in spite of pain. Mercury and North Node in the first house pulls towards public speaking to defend these rights, and pulls away from submerging into the partner. A tricky chart (when young) because the temptation for south node women is to lose oneself in the relationship. Having been married before this lesson no doubt has been learned. The double whammy is the moon in Libra, how to retain the Cancerian Moon Goddess sense of self and belief in the face of The Other, and The World? Fairness and adventure and values are deeply ingrained with the Moon/Saturn/Jupiter conjunction in the House of Communication. This woman was born to be a warrior – creating family while defending others. Mars in Cancer – she requires a fellow Fighter for Fairness and Freedom. Transiting Neptune shines glamour on her and the event at this time. What a lovely couple! Providing Ms Meghan can convert the Lioness from Actress to Royal leader (not supporting Consort) she’ll do fine. Providing Prince Harry can juggle saturnine career and need for structure (south node in career house) vs warmth and family (north node in 4th house of family) he’ll absolutely be in his element. I wish them both luck on this journey. If the wedding time changes please let me know? 11am to 12:15pm was the Royal Wedding for Prince William and Ms Catherine Middleton.